The third quarter of 2017 was a good one for US mobile operators. AT&T, T-Mobile, Verizon and Sprint all gained total customers last quarter and all except Sprint were profitable. AT&T gained 117,000 postpaid, 324,000 prepaid and 2.27 million connected device customers but lost 392,000 reseller customers for a total gain of 2.32 million domestic subscribers vs gains of 2.28 million in Q2 2017 and 1.53 million a year ago in Q3 2016. T-Mobile added 817,000 postpaid, 226,000 prepaid customers and 286,000 wholesale customers for a total gain of 1.33 million customers. That compares with gains of 1.33 million in Q2 2017 and 1.97 million in Q3 2016. Verizon added 603,000 postpaid connections and 139,000 prepaid customers for a total gain of 742,000 vs gains of 633,000 in Q2 2017 and 525,000 in Q3 2016. Sprint reported adding 168,000 postpaid, 95,000 prepaid and 115,000 wholesale customers for a total gain of 378,000 customers vs gains of 61,000 in Q2 2017 and 599,000 million in Q3 2016. Verizon, AT&T and T-Mobile were all profitable last quarter, Sprint was not. Verizon made a profit of $3.62 billion last quarter compared with $4.36 billion in Q2 2017 and $3.62 billion a year ago in Q2 2016. AT&T made $3.03 billion last quarter compared with $3.92 billion in Q2 2017 and $3.33 billion in Q2 2016. T-Mobile made $550 million last quarter compared with $581 million in Q2 2017 and $336 million in Q3 2016. Sprint lost $48 million compared with a profit of $206 million in Q2 2017 and a loss of $142 million in Q3 2016. *Estimated. Verizon doesn't report wholesale customer numbers. Verizon reported 115.3 million retail connections at the end of Q2, 2017. 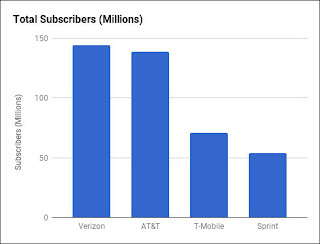 I estimate that Verizon has approximately 144.4 million total subscribers, including wholesale connections. América Móvil's Tracfone subsidiary lost 365,000 subscribers last quarter. That compares with a loss of 636,000 in Q2, 2017 and an acquisition driven gain of 1.2 million in Q3, 2016. TracFone blamed the subscriber loss on "a cleanup of our base and from increased competition in the segment." TracFone's revenue this quarter was $1.99 billion compared with $1.93 billion in Q2, 2017 and $1.89 billion in the third quarter of last year. América Móvil does not break out profit or loss by country, but it's EBITDA (earnings before interest, tax, depreciation and amortization) was $141 million, down from $211 million in in Q2, 2017 and $148 million in Q3, 2106) . On its worldwide operations América Móvil suffered a rare loss of 9.57 billion Mexican pesos ($501 million), which it blamed on the hurricanes in Mexico and Puerto Rico, the diminishing value of the peso and a $1.1 billion judgement against it in Columbia. TracFone operates the Straight Talk, NET10, Tracfone, Simple Mobile, Page Plus, Total Wireless, Telcel America, Walmart Family Mobile, GoSmart and SafeLink Wireless MVNO brands in the US. Postpaid phone customers are generally much more profitable than tablet, connected device, prepaid and wholesale customers. Industry watchers put a lot of emphasis on postpaid phone customer gains and loses. For the 14th consecutive quarter, T-Mobile lead the pack with the most postpaid phone additions. Only AT&T lost postpaid phone subscribers this last quarter. The number of branded prepaid customers grew by 419 thousand last quarter. AT&T added 324,000* prepaid subscribers. * Starting this quarter, AT&T is categorizing prepaid Internet of Things (IoT) connections (most of which are connected cars) as prepaid subscribers. rather than as connected devices. This quarter's 324,000 prepaid subscribers includes 97,000 prepaid IoT devices. In summary, All four national carriers gained customers last quarter and all but Sprint were profitable. But AT&T's growth was mostly in low revenue connected devices and TracFone lost customers and its EBITDA declined last quarter. what's a Verizon wholesale customer? MVNO customers, including those on Tracfone. Count me in as a future MetroPCS customer. I'm tired of waiting for Total Wireless to release budget phones (as in sub-$200) with at least 32gb of storage. There's no excuse for having 2015 tier specs on a $100 phone in 2018. ATT wins again. Two quarters in a row of absolute dominance. Too bad their market competitive behavior will come to an abrupt halt if the Sprint/T-Mobile merger is approved. AT&T counts this in their stats (2.27 million connected device customers). A metric that the other carriers omitted. How is that even Apples-to-Apples when they juice the stats with that BS. What is a connected device customer anyways? Thought those were Machine-to-Machine modems such as those in vending machines, ATMs, etc. Also things like OEM Auto infotainment systems/hotspots. The postpaid numbers tell the real story as always. My opinion is that AT&T is resting on their laurels, and the numbers reflect stagnation. If you are an optimistic type, perhaps they are focusing their efforts on their 5g buildup. Other indicators say that they are avoiding the wireless price war and shifting focus to their home broadband and entertainment holdings. I wouldn't call declining speeds and coverage "dominant." I get 16mbps on AT&T and iffy coverage in a solid 50mbps T-mobile zone. They deliberately made their postpaid numbers look weak by adding postpaid IOT to their prepaid tally. You realize you could buy a moto g4 with 32gb for $150, moto g4 plus with 64gb for $200,or a moto g5 plus with 32gb for $230? They all work on total wireless. My moto g4 says it's compatible in the phone checker... Check out B&h for them used and they're all even cheaper. Verizon won't activate any unbranded phones, I don't feel like farting around trying to use a TW device to activate a separate correctly sized sim, Verizon DPPs make me cringe at all the hoops and gotchas I'd need to jump through, and the G5 Plus doesn't have working Verizon volte. Fully compatible Verizon devices with 2018 tier specs just aren't accessible enough in today's market. At least on T-mobile, there's no shortage of affordable volte devices. Wow! A million customers fled Trashfone brands over the last two quarters. Wonder when that will hit a million per quarter. Selective reading. Profits up. 1.2M more customers last year. "cleaning up user base" means they stopped counting inactive users. This company is healthy and VERY profitable. You are just wishful thinking. 1.2 million by acquisition in Q3 of 2016 - 90% fled the ripoff minded customer disservice circus that is trash phone - look for that loss of at least another 1 million customers over the next 2 quarters. They always have some excuse re all the customers fleeing. Since they don't release profits by country your statement re that is wrong/false news. EBITDA down, $501 million (worldwide) loss for the quarter. Only thing up was revenue, slightly, proving once more that PT Barnum was correct. As Dennis correctly summerized above "TracFone lost customers and its EBITDA declined last quarter." The Titanic was a state of the art unsinkable ship. America Movil too??? Stay in dreamy denial all you want. Tracfone is 10X bigger than their next MVNO competitor in the US, and they will remain #1 long after we are gone. They are smarter competitors with a sharp focus on controlling costs and operations. Nobody else will ever get close. Rants won't change that one bit. I don't see rants above, just correcting dreamy tinged misinformed / skewed presentation of their performance. Dismal quarter to match their dismal CS. The allusion to the Titanic is apt. It too was unsinkable, the term too big to fail comes to mind also. #1 just means they have further to fall and the thud will be louder. Trashfone in the USA is a hot mess, maybe Movil will make it worldwide where Slime can buy influence and control markets. In the USA? Maybe not so much. Yo TracFone! Red Pocket offers more than DOUBLE min/text/data for $10/month or $99/year on any network we choose!! Being in retail outlets ain't saving you anymore. GET WITH THE PROGRAM! Undercutting the retailers that made them hugely successful would be massively stupid. Program for disaster. AT&T's gain seems to be mostly "connected devices", rather than people with phones. Why is AT&T the only carrier with this category? To make their numbers look better. Total Tracfone U.S. revenues climbed 5.3% year over year, reaching nearly $2 billion, and equipment revenues increased 40.2% as adoption of equipment installment plans grew. U.S. ARPU was up 7.3% annually and .8% sequentially. TracFone is in the midst of a steady—if modest—retail expansion (81 independent stores opened across the US). its U.S. customer base shrink 10.4% over the last year primarily due to customers leaving its SafeLink Wireless brand, which provides services through the Lifeline program under the federally funded Universal Service Fund. The FCC implemented new Lifeline requirements last year in an effort to reduce fraud and cut costs. When trashfone looses another couple million customers over the next 4 quarters I wonder what excuse they'll have next year. For years always some lame "reason" (they've been riding on that lifeline excuse too long already), never just that millions give up on them after experiencing their malicious customer disservice circus. Their financials as laid out above seems to indicate that they are still finding enough gullible sheep in the US to fleece even harder than before. Lifeline users have to recertify every year. So of course the losses will continue. The rules were tightened at least two times after the "secret" FCC study estimated there was $50M/yr in fraud lost. Paid by us in ever increasing USD fees. Loss resulting from churn in lifeline services is typically in the tens of thousands a quarter, no where near the typical quarterly average loss of a quarter million accounts at trac.